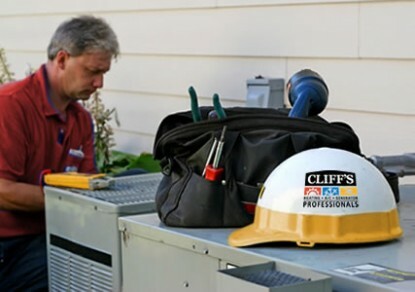 Cliff’s is here to expertly serve your heating, air conditioning and standby power needs. If you require repair and/or service for any make or model of HVAC or generator equipment, please contact us at (219) 682-0059 or toll-free at (888) 436-4888, or use our Service Request Form, and we will schedule a service call as soon as we are able. We service all makes and models of HVAC and generator equipment. We install and replace all types of HVAC and generator equipment. We provide FREE in-home estimates for new installations. We provide financing to qualified buyers. We are indoor air quality specialists. We are Puron refrigerant specialists.